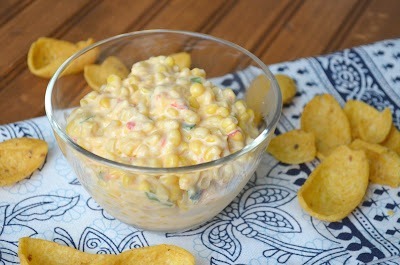 I've been hearing about Frito Corn Salad for a while, and the thought of making it always tempted me. Based on the different versions I've heard about, I decided to go a different direction and make a dip instead of a side dish. The result was refreshing and crisp. The corn kernels pop in your mouth, and it is ideal since there is no heating or baking involved. Perfect for these hot summer days. I recommend getting it extra, extra chilled before serving. Then the flavors have a chance to mold and blend together. Enjoy! 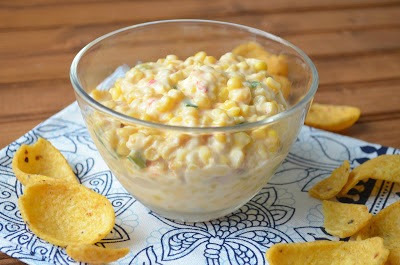 Mix corn kernels, mayonnaise, scallions and cheese in a small bowl. Cover and allow to refrigerate for at least 4 hours, or preferably overnight. 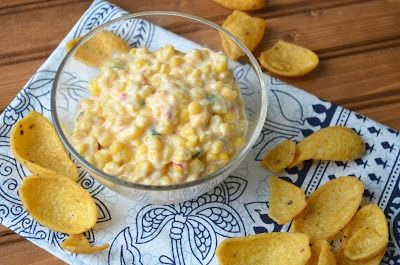 Serve with Fritos corn chips. This looks delicious! do you think the majo could be switched out for Greek Yogurt? Yes, definitely. It will probably make the dip a little more tangy, but I'm sure it will still be delicious. Let me know how it turns out!